I’ve been a fundraiser most of my life. At the age of 19 I started in the work of fundraising and never looked back. In this career path, I have been exposed to generosity of the greatest magnitude. But I’ve also seen that generosity is not something limited to the wealthy. Some of the most generous people I know are those who give from their small portions. The answers to these questions are very simple. I turn to the very book that I’m working to provide a platform for, in our nation’s capital: the Bible! I serve with Museum of the Bible as the Chief Development Officer. I’m tasked to lead a campaign to raise $1 billion as we establish a museum for the ages to honor and engage people of any faith and background with this great book — its history, narrative, and impact. Among the central themes of the Bible are money and stewardship. And as we see again and again, the Bible is not simply a historic volume; it’s living and vibrant, and relevant to people’s lives. So, the Bible’s principles of stewardship are actually inspiring generous giving in our world today. 1. Generous people often give more than they are asked to give. In Exodus 36:1-7, we see God’s people bringing more than enough to meet the need — to the point that Moses must tell them to stop! We don’t see too many campaigns today where givers are asked to stop giving! But when it does happen, it’s a special moment. Giving to a cause that makes you reach for your very best gift can bring some of the greatest fulfillment you’ll ever know! Often, over-funding a project can create a broader impact. The project can accomplish more than it was originally designed to accomplish. I worked on a project several years ago in response to the tsunami in Indonesia. People’s response was so great that we were able to establish long-term community development in that region of the world. Long after the disaster relief, we were still there, helping the people most affected. 2. Generous people give in response to a great cause. I’ve sponsored a child with a great organization, Food for the Hungry, for many years. I’ve never met this child. I’ve seen his picture, I’ve heard about his education and health care, but I’ve never met him. One of the most fulfilling things I do every month is read the reports about his progress, his spiritual growth. I will probably never meet him. But I believe so much in the cause championed by this organization, I can trust them to help this child through my giving. 3. Generous people give out of their substance, whether large or small. In Luke 21:1-4, Jesus compares the widow’s mite to the rich man’s gifts — demonstrating that the gifts of all are needed and used in God’s economy. This is a well-known story — you’ve probably heard or read it many times — yet it never gets old to me. In my world of generous giving efforts, and even the big project I’m working on right now, the most powerful moments are when I hear stories of sacrifice, whether big or small, in people’s giving. I’ve seen young children give of their allowance. I’ve seen people of means reach for the largest gift they’ve ever given to take a stand for the Bible. In each and every case, it’s the sacrifice that counts. Among many major givers these days, there isn’t actually much sacrifice involved in their giving. In spite of the volume of their contributions, their giving is small, relative to their total capacity. When you come across that person who sets something else aside in order to help accomplish a key task or vision — that is a special gift! 4. Generous people give more than just their money. In Luke 10:25-37, Jesus tells the classic story of the Good Samaritan — one who gave time, resources, and skill to meet the need of a man who had been left for dead at the side of the road. The Samaritan makes himself vulnerable and available — the very definition of hospitality. Generosity and hospitality are often closely linked. In today’s culture, I see more and more that generous givers want to give of more than just their financial resources. This is especially true of younger givers. They want to get their feet on the ground with the causes they’re supporting. Volunteering with an organization you’re passionate about is a great way to find a deeper connection to the cause. And sometimes — as in the story of the Good Samaritan — the opportunity is right there in front of you, without your having to search for it. Jump in with whatever you should give — money, time, skills — and see what God will do both in you and through you. 5. Generous people give even when it doesn’t make sense. In Genesis 45, we find Joseph responding graciously and generously to his family, even when logic would tell him not to. Sometimes giving to a project or cause makes no sense to anyone but you! Like Joseph, you may have been mistreated or harmed in some way, by a church or a cause. You still believe in the mission of the organization, but there are hard feelings. This kind of situation is a real test for me — a “grace check.” It gets at the very heart of my commitment to being a generous person. Moving beyond our humanity is the hardest thing to overcome. Setting aside differences in order to help do the right thing with your generosity is an act of real maturity, true Christ-likeness. 6. Generous people give to help others, even when they differ from one another. We see it in Luke 7:1-10, as a Gentile builds a Jewish synagogue! Who could have predicted such a donor for such a cause? Sometimes we’re given opportunities to help people outside of our worldview. Of course your conscience has to guide you as to how and where to invest your resources, but it’s healthy to keep an open mind, to genuinely consider the potential of various projects to accomplish something good and valuable, and to imagine yourself contributing to such an endeavor. It may become a character-growth opportunity for you ... and a boon to that worthwhile project. 7. Generous people give to see the impossible become possible. A little boy offered Jesus his meager lunch in Matthew 14:14-21. 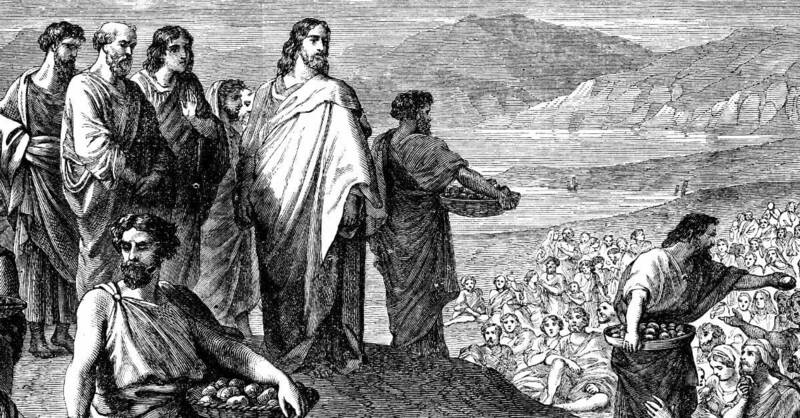 He only had a few loaves and fishes, and Jesus had 5,000 mouths to feed. But gifts in God’s hands can be — and often are — divinely multiplied to meet the demands of greater works. This is one of the greatest-ever giving stories, a beautiful picture of the faith to see something profound happen because of your gifts. First and foremost, the young man had enough faith to give his own lunch away! He was risking his own provision, his own comfort, in the hope of helping others. One boy’s faith is what set in motion the amazing miracle of Jesus feeding the 5,000. Sometimes we have to be willing to imagine something much greater than ourselves in order to get behind a project. I have to work through this every day at Museum of the Bible. It’s a project of such massive scale that it can be difficult for a prospective donor to comprehend how it could possibly come together. Yet, almost daily, I encounter the miraculous — in responses from generous givers, people from all economic demographics. They are turning what seems impossible into the possible. 8. Generous people give as a byproduct of their own personal transformation. The story of Zacchaeus, in Luke 19, is the story of a transformed giver. I love this story: a tax collector forsaking the norm in order to give — moved by Jesus’ call to come back to God’s ways. This is the story of someone who morphs from “collector of money” to “giver of money”! In my own journey, perhaps the most deeply satisfying stories are those of people who have been radically transformed in their giving due to a spiritual transformation. I’ve seen this repeatedly with givers who, at some extraordinary moment in time, suddenly realize why they are here: not simply to exploit their ability to accumulate wealth, but to create a story much greater than themselves. This, in a way, is a picture of redemption — as people rise above their personal limitations and see the supernatural potential of their own lives through their generous giving. 9. Generous people give out of their own poverty. Several years ago, I had the opportunity to travel to some of the most impoverished areas of east Africa. I was taken to many villages to speak, and I visited with the leaders in those communities. I’ll never forget the moment I saw firsthand the generosity of people giving out of their own poverty. After I had spent a full day in one village, the people came to send me off on my journey. They brought chickens, vegetables, fruit — even a goat. This was a very poor village — people had very little to spare. Yet they gave of their own poverty to thank me — someone from far away, who merely gave them a day in his life. It took me years to fully grasp that moment of generous and sacrificial giving. 10. Generous people give when others will not. In Philippians 4:15-16, the apostle Paul laments the lack of response from the churches he’s encountered. “Not one church shared with me,” he says. “Only you” — the Christians at Philippi. Even when he was ministering to others, far away, in Thessalonica, the Philippians were giving to his ministry! Most givers I’ve known like to be part of a larger giving community. It’s satisfying, perhaps comforting or reassuring, to know that you’re one of many giving toward a project. Yet sometimes, we are called upon as givers to stand alone, to see a project through to completion even when others won’t. This is the kind of situation in which Paul found himself. Others ignored the need, but one church — at Philippi — was willing to give, to provide the needed support, even if it meant standing alone. Your personal impact can be enormous. And your personal journey can be beautifully enriched for the experience. I love reading stories about people and their generosity. Generosity is not something that comes later after you accumulate wealth. It’s something you live out wherever you are in life today. It’s not something that “shows up” — it’s a lifestyle you cultivate. Generous people in our culture today are no different from the generous people mentioned in the Bible. Generosity becomes part of a person’s DNA; it permeates every area of their lives. How generous are you? And just as important a question: How are you generous? These are questions worth examining. The more generous you are, and the more ways you are generous, the richer you become! Timothy L. Smith has over 35 years of experience with Non-Profit Organizations and currently serves as Chief Development Officer for Museum of the Bible. His book, Donors are People Too is required reading for many NPO’s when developing a majoring funding program. To learn more about the Museum of the Bible, opening Fall 2017 in Washington DC, or to donate please visit MuseumoftheBible.org.